Pink noise is very useful in computer music and audio engineering, and I have always wanted an accurate pink noise object in the Pure Data environment. Generating accurate pink noise is not as simple as it might seem, so I spent some time designing a so-called pinking filter, and generalized it for any audio sample rate. This page describes the filter I ended up with, shows how its parameters are calculated, and displays the Pd object source code at the bottom of the page. The pinking filter creates pink noise by filtering white noise to create the desired pink energy spectrum. The filter's frequency response is -3dB per octave starting at approximately four Hertz and continuing to just below the Nyquist frequency. The pinking filter consists of several one-pole low-pass filters, where each low-pass is spaced two octaves from its neighbors and filter gains are attenuated in 6dB steps. This configuration results in a nearly linear -3dB per octave overall frequency response when the low-pass filters are summed. This algorithm is designed to work with any sample rate up to 192kHz. Filter coefficients are calculated by first determining the maximum cutoff frequency resulting in a filter coefficient less than one, described by the following formula where f is frequency and sr is sample rate. The - 1 ensures that the coefficient resulting from f is just below 1 to prevent the first filter from exploding. Following this, a series of low-pass coefficents are calculated by successively dividing frequency by four while it remains larger than one. This operation is expressed by the following while loop, where a is an array of coefficients and i is the array index starting at zero. The low-pass filter gains are calculated starting at 0dB for the lowest frequency filter, and continue downward in 6dB steps for each successive filter. An additional output gain factor is calculated so that the summed low-pass filters result in an overall frequency response that starts at 0dB-FS before proceeding downward. This process is described by the following while loop where g is an array of gain values, dB is the decibel gain value starting at zero, s is the sum of gain values starting at zero, og is the output gain factor, and i is the array index starting at the number of filters. Finally, pink noise is created by filtering white noise through the low-pass filters. The filters are implemented within a loop so that a variable number of filters may be used depending on sample rate, and this loop runs once for each sample of output. This implementation is expressed by the following statements where w is the white noise sample between -1 and 1, p is the pink noise sample initialized to zero, i is the array index starting at -1, f is the number of filters, y is the array of filtered samples, a is the array of filter coefficients, g is the array of filter gains, o is the output sample, and og is the output gain. 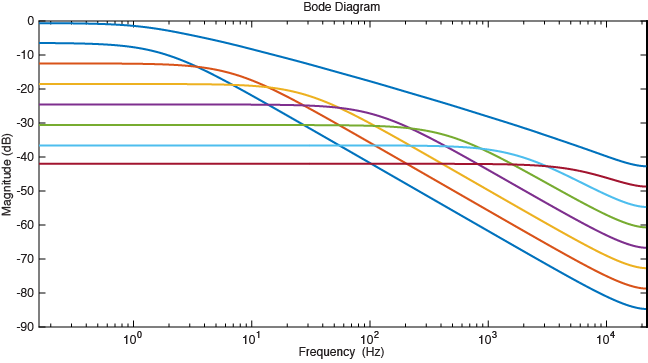 The graph below shows the pinking filter's frequency response starting at 0dB, as well as the individual low-pass filters' frequency responses below that. Sample rate is 44.1kHz. Below are lists of filter pararameters for common audio sample rates. Parameters for other sample rates may be calculated with the pink.m matlab script in pink~.zip.